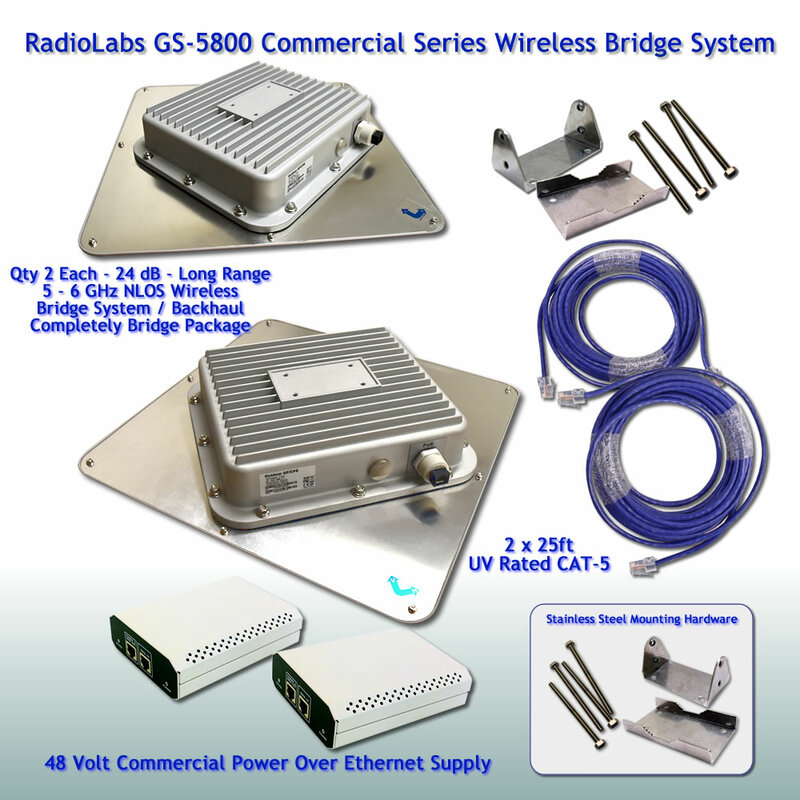 RadioLabs GS-5800, 5GHz Bridge, achieves amazing, long range, fast, 15o MBPS wireless bridging. Our new, GS-5800 Wireless network bridge incorporates a powerful high-gain antenna, with an advanced, feature-rich wireless toolset and highly sensitive receiver and powerful transmitter give you bridge range never before possible. This amazing new design, penetrates trees, leaves and obstructions, and line of sight range up to 20 miles. This 802.11A Bridge system, is a commercial class, fully contained wireless network bridge system, with Power over Ethernet, full stainless mounting hardware, in a solid aluminum enclosure. Simply stated, there is nothing better on the market for direct, commercial point to point network bridging. Originally designed and tested in the wireless security industry, where reliable, 5GHz, NLOS networking was required, the GS5800, has been tested over some tough terrain. Typically, 5GHz bridge systems have always required good, unobstructed Line-of-Sight for point to point links. This is normally true with standard panel or other antennas, which are always vertically, or horizontally polarized. With the RadioLabs GS-5800, 5 GHz wireless bridge system, our antenna delivers a tremendous 24dB gain in both polarized domains at the same time, essentially weaving it’s way through and around obstructions. This leads to excellent network stability with very little loss of data. When tested beside our 900MHz Wireless Bridge System, the GS-5800 5GHz Wireless Bridge, showed more stability, more wireless throughput, and higher data rates. The NLOS Wireless Bridge systems we offer, are always more reliable in terms of stable data throughput. Even our standard Line-of-Sight bridge kits show some NLOS characteristics, but they do not compare on the same level as multi-polarization antennas we offer. The RadioLabs GS-5800 long range, low latency wireless bridge, reduces data time with fast throughput and powerful processing speed, packed with all the robust wireless features such as individual control of packet size, adjustable distance, power, receiver sensitivity readings, interference monitor which scans for surrounding wireless signals which could interfere with reliable bridging, full bandwidth adjustments for upper and lower sideband, auto-distance calculations and WDS pairing, locking together the AP and Clients into a partnership which can’t be broken. Self-healing bridge network, automatically reconnects upon return of power or restoration of wireless partner. Robust 48v Commercial series POE, is fully 802.3af compliant, allowing you to supply power plus data through up to 330 ft of CAT-5 cable. Full independent wireless control allows the GS-5800s to be programmed into AP Bridge, AP Router, Client Bridge or Client router, allowing for almost any type of imaginable wireless configurations. RadioLabs GS-5800s, can even connect to remote AP Systems, and allowing for fully independent routing and NAT forwarding, through every single unit. This is a first, as it allows our users to partner with a primary AP, then form their own , fully configurable DHCP network, serving 253 users per client. This amazingly powerful bridge system is perfect for long range WISP, up to 20 miles or more, with a highly directional panel. The GS-5800, is just one of our powerful new bridge systems from RadioLabs, designed for an ever increasing digital world of long range wireless data. 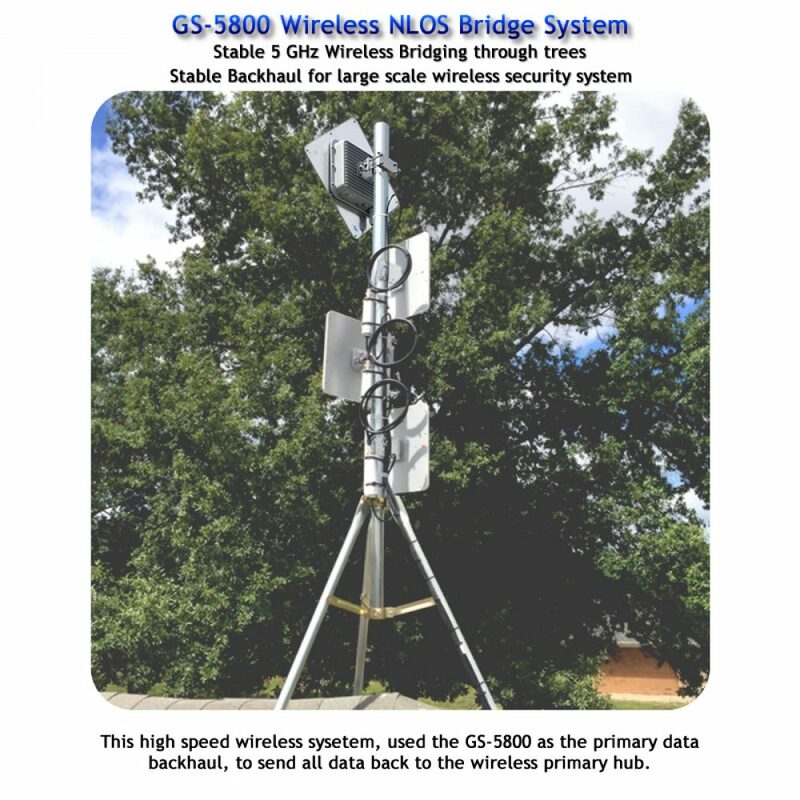 Whether used as a single backhaul or a reliable point to point bridge system, the GS-5800 fulfills the job, with this highly versatile, sensitive, long range 5 – 6 GHz bridge system. No other commercial series bridge system on the market offers so many features at a consumer level cost.